With just a month to go until the London - Monaco Cycle Ride, we bring you five reasons to support the teams behind this fundraising event. 40 cyclists are taking part in the London to Monaco Cycle Ride, organised by Winch Design in conjunction with Blue Marine Foundation. Made up of cyclists from the superyacht and ocean conservation worlds, the riders will undertake a gruelling 10-day cycle from London to Monaco Yacht Show in a bid to raise £500,000 for the Blue Marine Foundation. The first London - Monaco Cycle Ride takes 10 days and will see the teams undertake 10 stages, covering over 1,500km. They will take in three countries, passing terrain that ranges from gentle rolling hills to the majestic Rhone Alps. The cyclists will face 16,000 metres of elevation, and put their wheels through 16.8 million revolutions. A team of 17 from La Fuga is managing logistics and supporting the 40 riders as they make 10 stops on the road to Monaco Yacht Show. They will be taken care of by 17 highly trained support staff, including support vehicles, motorbike outriders, mechanics and masseurs. With just a month to go until the London - Monaco Cycle Ride, we bring you five reasons to support the teams behind this fundraising event. 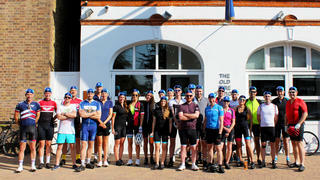 40 cyclists are taking part in the London to Monaco Cycle Ride, organised by Winch Design in conjunction with Blue Marine Foundation. Made up of cyclists from the superyacht and ocean conservation worlds, the riders will undertake a gruelling 10-day cycle from London to Monaco Yacht Show in a bid to raise £500,000 for the Blue Marine Foundation. The first London - Monaco Cycle Ride takes 10 days and will see the teams undertake 10 stages, covering over 1,500km. They will take in three countries, passing terrain that ranges from gentle rolling hills to the majestic Rhone Alps. The cyclists will face 16,000 metres of elevation, and put their wheels through 16.8 million revolutions. A team of 17 from La Fuga is managing logistics and supporting the 40 riders as they make 10 stops on the road to Monaco Yacht Show. They will be taken care of by 17 highly trained support staff, including support vehicles, motorbike outriders, mechanics and masseurs. One of the best ways to support the event without donning the lycra cycle kit is to encourage the teams. Follow the @LONDON_MONACO twitter account to keep abreast of their training and cheer them on with tweets, send them words of support on their Facebook Page, like their Instagram photos and keep an eye on their training on Strava. 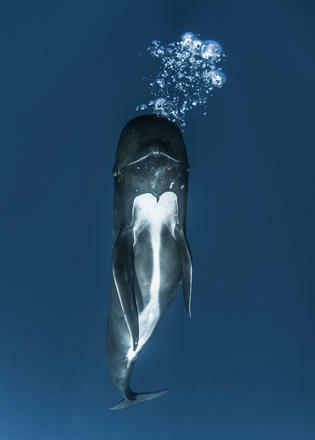 The teams are pushing themselves to the limit in order to raise money for the Blue Marine Foundation, a charity that is dedicated to creating marine reserves and establishing sustainable models of fishing. One of the most powerful ways to support the London to Monaco charity cycle is by sponsoring the teams and donating money to the Blue Marine Foundation. Boat International Media CEO Chris Downham and Marine Sales Manager Krystyna Ledochowska are joining the challenge, and you can sponsor all the riders on the team's Foundation Just Giving page. The teams are pushing themselves to the limit in order to raise money for the Blue Marine Foundation, a charity that is dedicated to creating marine reserves and establishing sustainable models of fishing. One of the most powerful ways to support the London to Monaco charity cycle is by sponsoring the teams and donating money to the Blue Marine Foundation. Boat International Media CEO Chris Downham and Marine Sales Manager Krystyna Ledochowska are joining the challenge, and you can sponsor all the riders on the team's Foundation Just Giving page. You might be able to watch the teams whizz past, or see them off in style as they start the challenge on September 18, 2016. The first chapter of the London - Monaco charity cycle is the gentlest, taking in 130km from London to Folkestone as the cyclists work their way from Tower Bridge to the steep hills of Kent and finishing at the British coast. Chapter two includes stages two, three and four and covers a total of 561km. Beginning at Saint Omar, the teams will stop at Saint-Quentin, Troyes and Dijon and as the terrain is relatively flat, it will be the chapter during which the most ground is made. 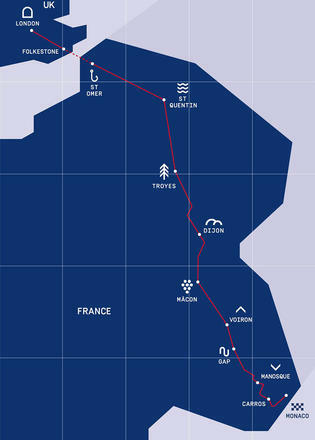 Chapter three will take the teams into the Rhone Alps, as they cycle 454km from Dijon to Gap. They will face 5,220m of elevation gain and it will take three days. You might be able to watch the teams whizz past, or see them off in style as they start the challenge on September 18, 2016. The first chapter of the London - Monaco charity cycle is the gentlest, taking in 130km from London to Folkestone as the cyclists work their way from Tower Bridge to the steep hills of Kent and finishing at the British coast. Chapter two includes stages two, three and four and covers a total of 561km. Beginning at Saint Omar, the teams will stop at Saint-Quentin, Troyes and Dijon and as the terrain is relatively flat, it will be the chapter during which the most ground is made. Chapter three will take the teams into the Rhone Alps, as they cycle 454km from Dijon to Gap. They will face 5,220m of elevation gain and it will take three days. 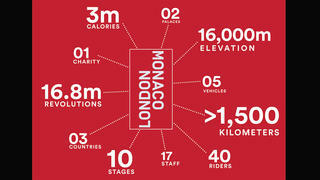 The end of the London - Monaco charity cycle is chapter four, which encompasses the final three stages. It begins with an intimidating 17.5km climb at Col d’Allos that will, of course, be followed by a drop down the mountains. As the teams cycle along the coastline from Nice, they will drop into Monaco and arrive at the Palace of Monaco, after a gruelling 10-day challenge. If you’re at the Monaco Yacht Show, you can join their friends and colleagues in welcoming the riders on September 27, where they will be greeted by HSH Prince Albert II of Monaco. However you choose to support the London - Monaco cycle ride, don't forget to sponsor their efforts on JustGiving. The end of the London - Monaco charity cycle is chapter four, which encompasses the final three stages. It begins with an intimidating 17.5km climb at Col d’Allos that will, of course, be followed by a drop down the mountains. As the teams cycle along the coastline from Nice, they will drop into Monaco and arrive at the Palace of Monaco, after a gruelling 10-day challenge. If you’re at the Monaco Yacht Show, you can join their friends and colleagues in welcoming the riders on September 27, where they will be greeted by HSH Prince Albert II of Monaco. However you choose to support the London - Monaco cycle ride, don't forget to sponsor their efforts on JustGiving.